The LG G7 ThinQ is a quality Android phone that excels in a few areas. The phone sports one of the brightest screens I've seen, for example, and its audio playback credentials are top, top tier. The internal hardware is fast and flagship competitive if not market leading, and its understated design is stylish, too, sitting somewhere between last year's offering and an iPhone X. Its battery capacity (only 3,000 mAh) is definitely less than ideal, though, and it lacks some of the standout, bar-pushing features of rival flagships. T3 very much liked the LG G6 smartphone on review, with us praising its stunning screen, Google Assistant integration, waterproofing, and more. A year later and the LG G6 is being succeeded with the LG G7 ThinQ and, as we will see, while you can still feel that heritage, the 2018 phone is a markedly different device. I recently attended a hands on testing event for the LG G7 ThinQ and what follows is my initial thoughts on the phone, as well as all the crucial information you need to get an accurate and detailed overview of LG's new flagship. If you're interested in LG smartphones, I would also recommend taking a look at T3's LG V30 review, which will help you complete the picture in terms of how we've got to the LG G7 ThinQ from the outgoing LG G6. The LG G7 ThinQ comes in four different colourways. The UK has got the 4GB of RAM, 64GB storage space variant of the LG G7 ThinQ. The LG G7 ThinQ is out now for a SIM-free retail price of £599. Carphone Warehouse currently have the phone in stock in the Aurora Black colourway. The LG G7 ThinQ is available in a total of four different colourways, including: New Moroccan Blue, New Aurora Black, Raspberry Rose, and New Platinum Grey. The LG G7 ThinQ has a notch, feels light in the hand, and - most importantly of all for some no doubt - still has a headphone jack. The first thing you notice about the LG G7 ThinQ is that it feels very similar to the LG G6 in the hand but now looks a little like Apple's iPhone X thanks to a notched screen. The notch, in partnership with some nice minimal bezels, means the LG G7 ThinQ's 18:9 aspect ratio screen really stands out, especially when it is turned on. On the left hand side of the G7 ThinQ you get a dedicated Google Assistant button. A similar cool to the touch aluminium frame wraps the phone's Corning Gorilla Glass 5 glass-backed casing, however, it is more polished than the G6 and as a result looks sleeker and slightly less industrial. On the right hand side of the phone's casing is a power button, while on the left hand side you get a brace of volume buttons as well as a dedicated Google Assistant button, which once pressed immediately launches the AI helper and, if held, even primes it for instant commands. On the top of the device you can find the phone's SIM card and microSD card slot, while on the bottom you can find its data and charging port of choice, USB Type-C, as well as a 3.5mm headphone jack. Yes, you can relax, the LG G7 ThinQ has a headphone jack. On the rear of the device you have the LG G7 ThinQ's dual 16MP camera system in a central, vertically-orientated position, and a circular fingerprint reader below that. The device's "G7 ThinQ" nomenclature and LG's logo are the only other additions here. Overall, thanks to the polished metal frame, glass front and back, and minimal bezels the LG G7 ThinQ, despite feeling rather light, exudes a premium look and feel. The LG G7 ThinQ ran modern smartphone games like Harry Potter: Hogwarts Mystery with ease. The LG G7 ThinQ comes packing a Qualcomm Snapdragon 845 CPU, which is very much the flagship smartphone processor of choice right now (it is installed in both the Samsung Galaxy S9 [in the USA] and Sony Xperia XZ2, for example). This compares very favourably to the LG G6's Snapdragon 821 CPU. I moved around the phone's menus and interface with incredible speed. Alongside this rapid processor sits (in the UK; the model tested) 4GB of RAM and 64GB of storage space, which again puts it bang on par with many of the best smartphones currently on the market. A 6GB of RAM and 128GB of storage space edition of the LG G7 ThinQ is also available, but that model will not be sold officially in the UK. T3 has found the device for sale quite easily at a variety of online retailers, though, so if you like the idea of extra RAM and storage, then you do have the option to plump for the better specced model. In terms of benchmark scores, the LG G7 ThinQ racked up an impressive Multi-Core score 8,561 in GeekBench 4, and a Single-Core Score of 2,439, which sits snugly alongside scores posted by other 2018 flagship phones such as the Sony Xperia XZ2 and Samsung Galaxy S9. The LG G7 ThinQ still fell short of the fastest Android phone currently on the market, the OnePlus 6, which returned scores of 9,046 and 2,478 respectively in the same tests. The 6.1-inch LCD QHD+ screen on the LG G7 ThinQ displayed content very well during T3's testing. As you would expect from a combined hardware spec that goes toe-to-toe with 2018's best phones to date, UI navigation and app performance on the LG G7 ThinQ was very fast and slick. I moved around the phone's menus and interface with incredible speed while testing the device in the hands on session and playing games, even the most graphically demanding and modern smartphone games on Google Play, was a no-compromise pleasure on the LG G7 ThinQ. Titles like Tekken and Harry Potter: Hogwarts Mystery ran flawlessly, with smooth gameplay and rapid load times. Equally, installing apps was lightning fast and switching between them didn't lead to lag or crashes either, with us able to cycle through them smoothly. The LG G7 ThinQ's Boombox Speaker added to the immersion of playing Tekken, with blows landing with real weight. The LG G7 ThinQ's screen was, without doubt, a large contributor to the experience, too. The phone's 6.1" 18:9 M+ LCD QHD+ (3,120 x 1,440) Super Bright Display, while not quite living up to the vividness of colour and jaw-dropping beauty of the curved super-sized one installed on the Samsung Galaxy S9 Plus, it did really pop, both in terms of brightness, colour production, and sharpness. It is the LG G7 ThinQ's screen's brightness that is the real star of the tech suite here, though, and especially so when you activate the phone's brightness boost mode, which ramps the panel's brightness up to maximum at the press of button. At maximum brightness (1,000 nit and displaying 100 per cent DCI-P3 colour gamut, which as LG is keen to mention is an industry leader) I found using the phone, even in bright direct light outdoors, to be incredibly easy, with the sort of glare and near-invisible screens that has plagued past high-end phones (the HTC U11+ is a recent example) when things got sunny, well and truly banished. You get a rear dual 16MP camera setup on the LG G7 ThinQ. And talking of that super screen brightness, let's hope that our future battery testing goes well, as the LG G7 ThinQ only comes with a 3,000 mAh battery. Now, while raw capacity certainly isn't everything when it comes round to determining a phone's battery life, with optimisation playing a part, it is very important and when you compare the LG G7 ThinQ's offering to other maker's flagship offerings it either matches or falls short. It even doesn't match the LG G6's battery, which was rated at 3,300 mAh. Portrait Mode is LG's crack at the bokeh-tastic background shots that Apple devices have recently made vogue. To test the battery's quality I ran GeekBench 4's battery test for 2 hours straight with dimmed screen on. The G7 returned a battery score of 3,909 and a confidence rating of "Medium". This score is firmly lodged in the mid-range in terms of battery performance scores in GeekBench 4, with it outscoring devices such as the iPhone 8 and Google Pixel, but falling short of phones in both the mid-range and top-end such as the OnePlus 5 (4,196) and Samsung Galaxy Note 8 (5,000). Naturally, these scores are difficult to translate into real-world usage cases, but going from my experience with the LG G7 ThinQ it is very much in the day to day and half range in terms of performance between charges, which is fine but far from ideal, and offers little to nothing of an upgrade over the outgoing LG G6. Somewhere where LG G7 ThinQ does definitely upgrade on compared to last year's G model though is its camera system. Detail on the LG G7 ThinQ's camera shots seemed very good in well-lit conditions. Check out the fine discolouration on the bulb's internal glass. The LG G7 ThinQ comes packing a dual 16MP rear camera array, as well as a front-facing 8MP selfie camera. The rear cameras deliver both standard and Super Wide Angle configurations, and thanks to a refreshed camera interface now offering 19 shooting modes and LG's AI CAM tech, which automatically analyses each potential shot and recommends the best mode in which to capture it, means that taking multiple photos of different objects and scenes quickly is easy. Neatly, this shooting system also allows you to select from various filter and effect options post-shot, too. I noticed some un-ideal, grain-heavy image processing when certain shots were blown up. There are also two completely new camera features offered this year in the LG G7 ThinQ: Portrait Mode and Super Bright Camera. Portrait Mode is LG's crack at the bokeh-tastic background shots that Apple devices have recently made vogue, with the subject remaining crisp and clear but the background blurred for added focus and definition. Super Bright Camera activates automatically when you are in a dark, low-light environment. As you can see from the image below, shots can be taken with or without bokeh (you can move a slider to determine just how much blur you want), and when it is activated it works well. Two selfies taken with the LG G7 ThinQ's front facing camera, one with bokeh off and one with it on. Mmmm... blurred background. Equally, Super Bright Camera is LG making a big push on low-light photography, which seems to be a feature gathering momentum across Android devices this year. LG states that Super Bright Camera, which activates automatically when you are in a dark, low-light environment, offers images that are up to four times brighter than typical offerings thanks to a combination of pixel binning and software processing. As you can see from the Super Bright Camera selfie shot below, the feature does actually provide flashless results that seem to me to be in-advance of many of its competitors right now. Chapéu LG. A low-light selfie shot on the G7 ThinQ. The shot isn't crisp but it is surprisingly bright and defined. The LG G7 ThinQ's AI CAM function also has the capability to automatically detect what the subject of the potential image will be, before then proceeding to select the optimal mode (as aforementioned) and settings for it to be shot. I tested this feature and found it to be a little hit and miss. Certain things, like animals, people or buildings it has no problem with, but others required a couple of attempts for it to register, or it couldn't identify / tag the subject the image. Two shots with the LG G7 ThinQ's AI CAM turned on, and one with it off. Note how in the image of the dog AI CAM has identified it as a "Pet". And, speaking of AI, the LG G7 ThinQ comes with a dedicated Google Assistant button that, once pressed, launches it and, if desired, primes it for instant use. This is good as not only does Google Assistant pop up immediately on a single press of the button, offering quick access to its already well developed functionality, but if you hold it down then you can immediately begin talking to it without having to say "Ok Google". If you do want to activate and ask questions to Google Assistant via voice, though, then you can do so from up to five metres away as well thanks to the LG G7 ThinQ's support of Super Far Field Voice Recognition (SFFVR). You get a dedicated Google Assistant button on the LG G7 ThinQ, which allows you to jump straight to its feature-functions and talk to it without saying "Ok Google". While LG has followed the on-trend notched screen with the G7 ThinQ, it has catered for those who prefer a notchless display by upgrading the handset with a New Second Screen function. As you can see in the images below, this is accessed in the system menu and allows you to alter whether or not the screen displays with or without notch and, if you select to have no notch, then customise what colour and corner style the phone's top bar has. On test this worked well, even though only five notchless bar styles were available, and one of those was flat black. The LG G7 ThinQ's "New Second Screen" allows you to hide the phone's notch if desired, or customise the top bar in terms of colour and corner shape. Lastly but certainly not least in the LG G7 ThinQ's feature set is its audio experience credentials, which I have to say are really rather impressive. Last year we complained that while the LG G6 felt premium in the hand it did feel slightly hollow, which was apparently down to ensuring battery safety. This year the phone still feels slightly hollow but now has turned that into a useful function - Boombox Speaker. Boombox Speaker harnesses that internal gap as a resonance chamber to deliver enhanced bass. The G7 ThinQ's Boombox Speaker harnesses that internal gap as a resonance chamber to deliver enhanced bass. It is simple to use, you simply place the phone on a solid surface or box and the smartphone utilises its resonance chamber as a woofer to amplify the bass effect even more. We listened to multiple tracks via the Boombox Speaker and, while we are not particular fans of listening to our music on anything other than a top set of proper speakers or via a great set of audiophile cans, we have to admit that the volume and bass was very impressive for a phone. If your potential usage scenarios are more like ours, though, then you'll definitely be pleased to hear that the LG G7 ThinQ also comes rocking both DTS:X virtual 3D sound for all content (up to 7.1 channel with earphones) and also a Hi-Fi Quad DAC. With earphones in you can enable DTS Headphone:X, which grants 7.1 surround sound. DTS:X surround can be simply turned on and off via the G7 ThinQ's swipe-down menu, and the Hi-Fi DAC and its settings can be turned on and tweaked in the phone's sound sub-menu. From my time listening to my suite of testing content on the G7 ThinQ, I was very impressed with its audio playback functionality and features - it is definitely one of its headline strengths. My overall opinion of LG G7 ThinQ is positive, but not in a terribly exciting way. Its hardware is definitely competitive and it performs at the level of 2018's other flagship phones on the whole, however, there are very few standout features or areas of innovation to give it a unique character of its own. That said though, the LG G7 ThinQ's audio playback credentials are very impressive, so for audiophiles it definitely should be under consideration. A Hi-Fi Quad DAC and DTS Headphone:X support combine to deliver a true audiophile listening experience with a good pair of headphones on, while the phone's Boombox Speaker takes volume and bass on a smartphone to a new level, too. The AI tech built into the camera and screen is also well implemented in general and judging from my usage scenario, will likely prove very useful on a day-to-day level G7 users. I liked the dedicated Google Assistant button positioned on the left hand side of the phone as well, which was very easy and fast to use. And, simply put, I was very impressed with both the brightness and crispness of the LG G7 ThinQ's screen, especially when we triggered its boost mode. It made using the phone and consuming content a pleasure even in a bright outdoor environment. In fact, actually, the only things I was actively disappointed with on the LG G7 ThinQ was its battery life and grain-heavy image processing, both of which were far from ideal. So, yes, the LG G7 ThinQ is a well-executed Android flagship that should appeal to fans of the iPhone X aesthetic, top-level audio credentials, and interesting applications of AI. The G7 also does enough to squeeze into our prestigious best smartphone buying guide. It just struggles a little to separate itself from other, equally well equipped flagship Android phones. 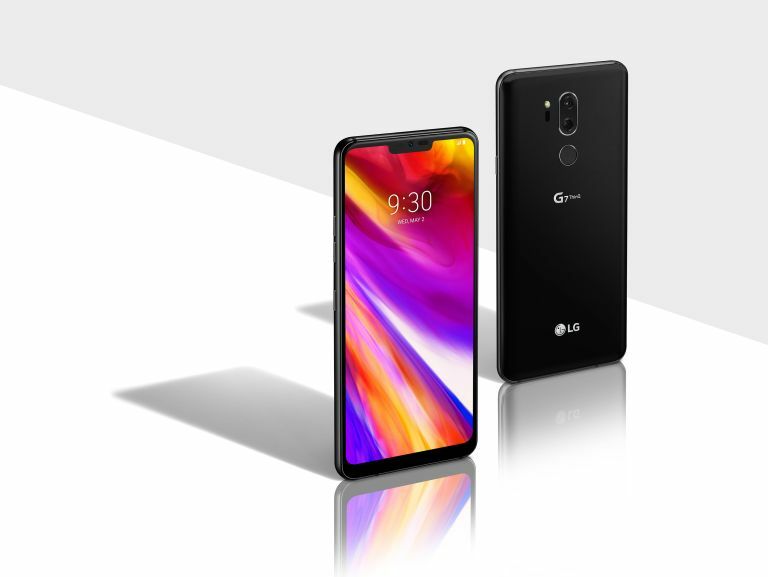 For more information about the LG G7 ThinQ then check out the phone's official web page. LG G7 ThinQ vs LG V35 ThinQ: which LG flagship phone is the best buy?